On Thursday, March 7, 2019, the San Leandro Planning Commission and Board of Zoning Adjustments unanimously approved a project proposed by Maximus Real Estate Partners that will bring 687 apartment units to the Downtown Transit-Oriented Development area. 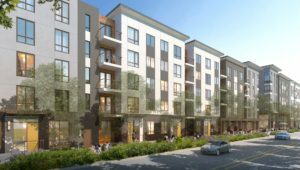 The 5.73 acre redevelopment site at 915 Antonio Street is just south of the San Leandro Creek and within a short walking distance from the San Leandro BART station. The FH Dailey Chevrolet car dealership is along the south and Union Pacific Railroad tracks are on the west. 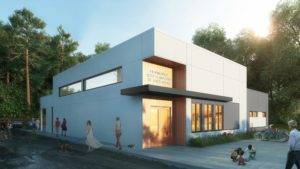 An Alameda County Fire Department training facility borders the site along the north.In addition to the new residential units, the project will include construction of a new, 4,326-square-foot conservatory at 844 Alvarado Street for the Filarmonica Artista Amadora de San Leandro Music Conservatory, across the street from its current building. Existing buildings will be demolished to construct the 931,989-square-foot development which will consist of two buildings with a shared underground garage. One building will be six stories tall while the second will be five stories. A total of 892 parking spaces will be provided, along with parking for 520 bicycles. The buildings will host a mix of studios, one-, two- and three-bedroom apartments. Each apartment will come equipped with a full kitchen, plus a washer and dryer, and about 30 percent of the units will also include private balconies. 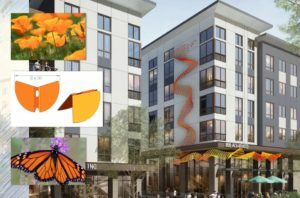 More than 130,000 square feet of indoor/outdoor amenities will include rooftop gardens and terraces, bicycle lockers, a clubhouse, a 550 square-foot cafe, a dog park and a dog wash area, as well as a pool and outdoor spots for barbecuing. Furthermore, the complex will have on-site maintenance, leasing staff and property management. Maximus has proposed a significant investment in a public art component that will be incorporated into the building design. Artist Shawn HibmaCronan has been engaged by Maximus to design a sculpture concept consisting of 2,022 individual, laser cut components, each uniquely formed and arranged. In an homage to the Caterpillar Equipment Company that formerly occupied this land, the laser cuts will be coated with the iconic gold color of Caterpillar equipment, while simultaneously evoking impressions of Monarch butterflies and California poppy fields. why does San Leandro insist on building more housing on streets that don’t have any exit except Davis Street? I live on Preda St. and many houses were built at the end of the street and the traffic is HORRIBLE for those of us that live near Davis Street. Yet, the City of San Leandro did nothing to provide optional exits from the neighborhood except down Preda Street to get to Davis Street! People speed past our house to make it to the green light or have fun and burn rubber/speed on the straight-away on Friday night! So, now we have another monster housing/retail project with no exit other than Alvarado to Davis Street… why doesn’t the Planning Commission think of these things… did anyone bother to think about how many cars 1MM sq ft of condos would generate? Alvarado and surrounding neighborhoods cannot handle the traffic load. There aren’t enough lanes, the lights are inadequate and the crosswalks across Davis Street are already scary. Please let me know posibillities of renting or buying. Thank you! It would be great if this site could provide info for the hearings on these projects. I would love to share my input on these issues but never know when any of these events are. Maybe have a section on the side bar with “upcoming meetings” or something like that. thanks! love the new projects. nothing better than capital flowing into san leandro. parking and traffic will get worse, but san leandro real estate values will certainly go up (and with that hopefully better schools and less crime). We need more of these projects, Bay Fair TOD is next on the radar?